We finally broke down and got our ultimate Alaska toy: a 4-wheeler! It seems like everyone up here has multiple 4-wheelers, and we understand why: there are lots of areas that are too mucky to hike through, and the distances great, so there are many places that are only accessible by 4-wheeler or horseback. Up here these are work tools as much as recreational vehicles. The one we got is 500 cc and definately workhorse vintage, which is what Doug wanted. In Alaska, Honda has an 80% share of the market (compared to 60% of the share in the lower 48). After doing careful research, Honda came out the clear winner. They are a head above all other ATV's; they just don't have the problems that some other brands have, and they can last a long, long time if well taken care of. This is the first time we've found anything cheaper in Homer than in Anchorage, but this machine was going for a couple thousand more in Anchorage, and we paid less than the manufacturer's recommended price. The dealer threw in a 4-wheeler cover for free since the kids he hires to clean them didn't clean them; that was a $200 benny, and the ATV wasn't all that dirty! We held off on getting a trailer just yet, since we will probably just go from our place here for the winter. Our neighbors let us borrow their trailer and helmets. To celebrate our new acqusition Doug drove our 4-wheeler up to school with Denver on with him. He got there faster than I did in the Durango! I drove back home with Aurora, taking a few side excursions down trails, much to Aurora's delight (I guess she likes going through big mud puddles!). Don't worry, we are NOT going to let our kids drive this thing. Besides the fact that kids under the age of 16 are not supposed to drive 4-wheelers, this is a BIG 4-wheeler with a lot of power. The kids were very bummed to hear this. When I asked Aurora if she would like a 4-wheeler for Christmas, she got this glint in her eye and gave a very firm nod. Hm. "The Coast Guard Cutter HICKORY in Homer is opening her haunted doors and creaking hatches to all who dare to walk her dark passages. All are welcomed, but be warned...bring your scream with you." Thus proclaims the flyer for the Haunted Hickory which Doug, the kids and I dared to enter tonight. It was docked at the ferry terminal of the Homer Spit. There was a longer line for this than even the Dept. of Motor Vehicles--at least a half an hour wait on the dock. Luckily they had fires going in big metal drums to warm ourselves while we waited. The moon was full tonight, and the clouds scudding over it creating the perfect eerie atmosphere. This event was free, though a 2-can donation for the local food pantry was appreciated. Aurora was excited to go because the kids at school said it was actually scary. They had a "less scary" version for those 7 and under the first hour of each night (tonight and tomorrow night), but we went to the "full scare" version. It was really cool, and the kids and I enjoyed it. The scariest part was being followed by the skeleton who kept crowding into us, and there were lots of surprises as we climbed up and down ladders and stepped through hatches. There were some gruesome parts, but not too bad. The kids both considered it well worth the wait, and Aurora wanted to do it again! No pictures, since it was so dark, and the ship sure wouldn't look spooky in the daylight! The barn you see here is almost entirely filled with hay, but the catch is it is formed into a maze of tunnels that are just big enough to get through. As part of the Girl Scout event Oct. 19, each girl (and some of us brave adults) paid $5 to go through this maze. I am very glad that one girl mentioned taking a flashlight, and I had one in the car, because while I am not claustrophobic, it was uncomfortable at times. I did not trust Denver to go through by himself, so he crawled in first with the flashlight and I came after him. At times he would go around a corner and it was pitch black and I had no idea which way to go besides by feel. I was wiggling along on my belly and elbows to get through, and in a couple of places where we had to go down or up it was a really tight squeeze. The kids all had great fun, and Aurora and Denver both went through 3 times. Once was enough for me. Of course, as luck would have it, I had on a wool hat and wool sweater as I crawled through, so while I waited for the kids to keep going through I was plenty busy picking hay out of my hat, sweater and hair! 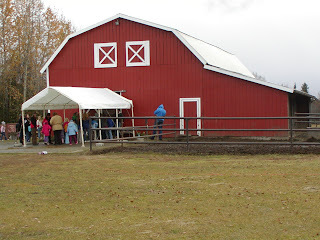 The family that runs this barn does so only for groups on a reservation basis. They used to end visits at Halloween, but groups kept calling and asking to go through. They have 17 horses, so this is their winter supply of hay. Each year they make the tunnels differently as they get the hay and build the maze. They are located a few miles north of Soldotna a mile down a gravel road which was a little bit difficult to find. They do require signed waivers, which is a really smart idea. And they said one person once lit a match while in the maze because they didn't have a flashlight and they freaked out. Hmmm. Do you think this place is combustible??!! However, the freaking out part I can totally understand! Friday, Oct. 19 all the Girl Scout troops from Homer, plus one from Seward, made a trip to Kenai to the Challenger Learning Center of Alaska. This place is billed as the closest simulation to a space flight besides the real thing. Anyone can take tours of the place, but the activities and simulations are only open to groups. Many corporations come here for training, teambuilding or even interview missions where they put the various candidates for a job in a room and see how they react to situations. This is a non-profit organization hosted in a 9-million-dollar building that is debt free. 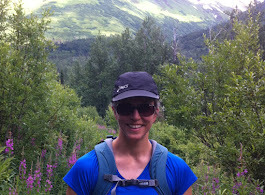 Since Kenai is home to many huge oil companies they have some hefty sponsors. Aurora, pictured above, started out in the Space Station. 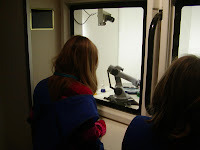 Each girl had a task; hers was to use the robotic arm to pick up and weigh a solution. She said it was very challenging. Halfway through the 2 1/2 hour session they switched with the girls in Mission Control. There Aurora was Isolated 1. She found it really exciting to use email to connect with the other people on this mission. Each person had to complete their task in order for someone else to complete their own. Aurora liked getting on the computers in Mission Control most, and said the whole experience felt almost real. Denver went along (since I was a driver) and he got to go through the rocketry session for the K-2 kids (there were 2 other boys in this roomful of 35+ girls, but that didn't stop Denver from raising his hand every time he knew an answer!). He said the best part of it for him was having to communicate in order for teamwork to happen. Everyone was broken up into groups of 6 and had to develop a balloon rocket. Part of the challenge was to discover what level of payload would be "just right" to make the rocket fly best. Denver said in his group the rocket launch that worked the best was with 1 payload (a paperclip), though they tried it with up to 6 payloads. 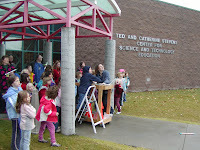 Then the kids got to make their own paper rockets and then went outside and launched them. The laucher had 30 pounds of pressure and some of those rockets really flew!! Many even embedded into the ground. Needless to say, that was great fun! OK, you people not from Alaska, what does PFD stand for? Having worked in the newspaper business, when I started seeing that I thought it was a typo and was supposed to be PDF. Nope. It stands for Permanent Fund Dividend, the money the State of Alaska gives out to every citizen of Alaska each year. This year it is about $1400 I believe. I am startled at how strongly some Alaskans view their entitlement to this money, and how outraged they are when they don't get as much. As an outsider I'm like, "Hm, no state taxes, plus they give you money. What are you complaining about??" Unfortunately we will not get dividend for another 2 years. The application period opens Jan. 2 of each year and lasts a few months. You have to have lived in the state for a full year when you apply. Thus, we will not be able to apply until Jan. 2009, and receive our first dividend in Oct. 2009. Bummer. I'm looking forward to bolstering my kids' college funds. It's like a tax return in October! My husband had two back-to-back conferences in Anchorage last week into this week so the kids and I drove up to Anchorage to spend the weekend with him. Here are a few notes about the drive and the city. I forgot my camera, which is a bummer because the mountains were gorgeous! Snow-capped peaks rose up above the clouds and took on new dimensions I didn't notice in the summer. Wish I had a picture to share. I was impressed that I made the drive from the kids' school on East End Road to downtown Anchorage in 4 hours. I was really pushing to get there before dark, but since I wasn't sure what time "dark" was, I just pushed to get there ASAP! It was the first time I drove the entire way myself and I noticed things I don't normally notice. First of all, it is really quite an easy drive. There are no big mountains to climb, no switchbacks, etc. The worst of the drive is where the road winds along the Kenai River, the road is rough and narrow, and the speed limit is 35 mph. Besides that the speed limit is generally 55 or 65 mph, there are a decent number of passing lanes and the roads are in good shape. The most frustrating part of the drive is slow drivers. I was really impressed with how many drivers pulled off and let me and others pass if they were holding up traffic. While there is a law that makes holding up more than 5 vehicles illegal, in the summer the RV's wouldn't get anywhere because they'd always have 5 vehicles behind them so they just plug along. It was so courteous of the drivers to pull off and I resolved to do the same if/when I am in that situation. The scenery is incredible, particularly once you get into the mountains north of Soldotna and they are with you all the way up to Anchorage. Part of the purpose of my trip was to get studded tires for our Subaru. I didn't even price them in Homer because everything in Homer is much more expensive than in Anchorage, so I don't even know if I saved any money after spending $60 in gas to get up there! Studded tires appear to be the norm here. If you've read the post about my drive to work, you'll know why I'm getting them. Six or seven days a week I'm driving the tight turns and mountains road to work. From what I hear, black ice is common because of the elevation change. I was hydroplaning in places on the drive up to Anchorage, and though it was much rainier on the way back today the car handled better. Those studs will come in handy! We were looking forward to going shopping at the Dimond Center Mall. It is a nice, big, multi-story, modern mall, and even has an indoor ice skating rink and attached hotel. We got there when they opened at 10 on Saturday and went to get Aurora's ears pierced. Well, Aurora passed out in the earring store after getting pierced so we just weren't in the mood to shop after that. The bagel shop across the street from the mall had really yummy breakfast burritos and breakfast bagels that got us all calmed down and back to normal. We are not big-city people, but Anchorage does not feel like a big city. It has some tall buildings (the Sheraton Doug stayed in has 15 floors), but it does not have the typical road infrastructure of a big city, nor the really bad traffic. It feels safe and comfortable (at least the places we were). I believe the population is about 250,000, which makes it smaller than some of the small cities in Michigan like Grand Rapids, and it is nothing like Detroit or Chicago, which I think of when I picture a "big city". We saw quite a few people with "homeless" signs, but they looked pretty clean-cut; again, not the type of homeless people you see in Chicago. I saw more police this weekend on the roads than I have seen in our entire 4 months here, and they actually had stopped people which I don't think I've seen once since I've been here. There is generally an amazing lack of police on the roads. Like Doug said, there are certain corridors they patrol at certain times, and I suspect I was driving during those peak travel times this weekend. Four months into our new life here, I thought I would give a miscellaneous meandering of things that strike me, particularly after spending a week back in the midwest. When someone asked me this past week, "Is Alaska really that different?" what came to mind was "wilder", "rougher", and "more remote". It is difficult to pinpoint exactly how and why that is, but Minnesota seemed very tame, and back in Alaska I can feel the "edge" of wildness again. Today the sunrise was at 8:30 a.m. The days are rapidly growing shorter. It is still light out at 7 when I wake up, just no sunshine till a little bit later! This past week there was snow at our kids' school, though we didn't get any here (the school is actually a few hundred feet higher than where we live). It is fascinating because there are mountains everywhere and you can "see the snow coming." It snows at higher elevations first, and the line where the snow stops is getting lower and lower. The glaciers we see from our house (Dixon and Portlock) were blue all summer, but are now white and covered with snow once again. Fall colors here are peaking. Everything that can turn yellow, has turned yellow. The most beautiful sight right now is the yellow trees with green spruce mixed in, snow on the elevations, deep blue lakes below the mountains. Wow. Gas is still $3.17 for a gallon of gas in Homer, while it has gone as low as the $2.70's in Anchorage. It has been at that price since we've been here. There is not a lot of fluctuation in gas prices like we saw in Michigan. The diversity of people here is still one of my favorite things about Homer. It seems like everyone has some sort of accent, and it is fun to try to figure out just what type of accent it is!! The other thing is that we really appreciate visitors from the Lower 48. It is fun to share and show this area with people. Overall the quality of life here feels much higher than our life in Michigan. Again, it is difficult to put our finger on, except to say that our kids' school is awesome, Doug's school and district are very good, as is my college. Basically I think that we fit into what is available in this area. My mother died recently and with a 2-day notice, I needed to get down to Minnesota. Thus I discovered one of the biggest downfalls of living in Alaska: the amount of time it takes to get anywhere. I got to the Homer Airport at 12:30 p.m. on Thursday, and did not get to Chicago until 6 a.m. Friday morning. 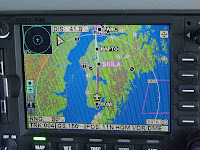 I took a Grant Aviation flight from Homer to Anchorage. The hilarious thing is I saw one of my cousins walking through the Homer Airport. I didn't realize she was going to be my pilot! She just started working for Grant 2 weeks prior and is pictured above. 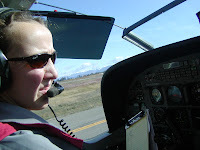 She invited me to sit in the co-pilot's seat of the 10 seater; she didn't have to ask twice! It was really cool seeing all the controls up close. I also enjoyed seeing Homer from the air. 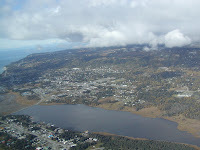 Yep, that's the entire town of Homer above. There are many more homes, but this is Homer proper. After a 2 hour layover in Anchorage, I flew to Las Vegas. After another 2 hour layover, I flew on to Chicago. What with the time change (3 hours), it made for a long, long trip, and not something I would want to do regularly. On the plus side, for the return trip I left Minneapolis at 9:30 a.m and reached Anchorage by 4:00 p.m. By cutting my layover times, it also meant I had to run to catch my connector in Vegas. They should have taken off already, but since there were 5 of us who needed to catch it, they waited for us (thank goodness!). A number of people I have talked to have moved back to the lower 48 for just this reason: it is so far from people's family. If a person doesn't earn enough money to fly back to visit relatives (and driving is not much cheaper, and a lot longer! ), then it is nearly impossible to ever go visit. That can be a big downfall to living in Alaska. We are glad we have relatives here, if only a few.